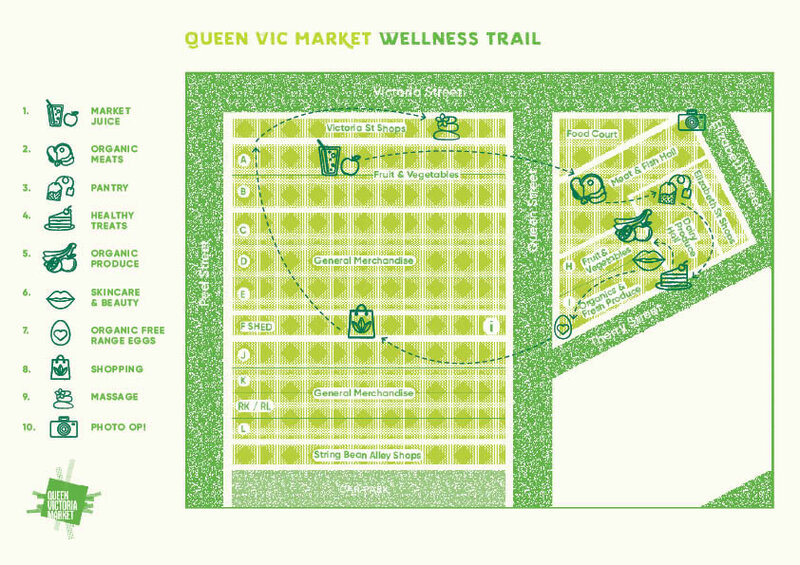 Download a copy of the Market Wellness Trail Map here. Make your way across Queen Street Plaza and through to the Market's historic Meat and Fish Hall. If you're on the hunt for organic meats, then you have two options; Hagen's Organic Meat & Mr Organics. Hagen's Organic Meats was one of Victoria's very first organic butcheries, working closely with their farmers to ensure the best quality organic goods. Further down the hall, you will find Mr Organics, specialising in organically pasture-fed, free range pork, lamb, beef and poultry range mostly from Victoria. As you exit the Meat and Fish Hall, you will soon find yourself in front of the iconic Queen Victoria Market entrance. Take a short walk along the bustling Al Fresco eateries of Elizabeth Street, and through to the infamous Dairy Produce Hall. Stock up on Organic Quinoa at M & G Caifa, browse the endless selection of locally and internationally blended teas at McIvers Coffee & Tea Merchants, or enjoy a healthy salad, soup or smoothie from one of the hall's many vendors. We also recommend a visit to Gewürzhaus Herb & Spice Merchants where you can 'pick n mix' just about anything from turmeric to black lava sea salt. From here, make your way past the eclectic Therry Street Pop Ups shops and to Invita. Take a seat, relax, enjoy the sounds of the buskers, and indulge in a not so naughty piece of vegan & gluten free chocolate cake with an organic fair trade coffee! After watching the world go by, make your way through to the Organics section of the Market. For fresh organic fruit and vegetables, there are two Certified Organic Retailers on offer. Garden Organics, where you will find a wide selection of chemical free produce sourced daily from Melbourne's Wholesale Markets and local farmers. From here, pay a visit to Market Organics and browse the delicious range of certified organic and biodynamic, vegan and gluten free grocery products that includes milk, yoghurts, rice, cereals, tofus, grains, jams, honey and more. By now your shopping bag or trolley should be at the brink of overflow, however be sure to leave a little room for some much deserved skincare and beauty products. At Coconut Revolution, you will find a range of products boasting the much loved benefits of pure Coconut Oil, including moisturisers, body scrubs, soaps and more. From here, make your way to De'Bee Signature Lip Balms to pick up a tub of your very own hand crafted balm, made from the honey of Ballarat Bees. Next stop, The Eggporium where you will find a huge range of Certified organic eggs, free range eggs, brown eggs, white eggs, duck eggs and quail eggs, all sourced from selected farm across Victoria and Australia. And don't forget to browse the tasty selection of honey! Alternatively, stop by Shed-B and say hello to Peter and his sons at The Eggsperts. Peter, Leo and Rocco have over 30 years experience in the industry, specialising in certified organic and free range eggs as well as a huge range of local, raw and organic honey, including Manuka. Now that you have stocked up on fresh produce, it's time for a spot of shopping in the General Merchandise section of the Market. Our favourites? Choose from the rare selection of locally crafted goodies at Re Incense and Oils, browse the eclectic candle range at Inner Essentials, or take a walk through String Bean Alley to Petal Melbourne, stocking organic skin care, loose leaf teas and all natural soaps. Ok so this may be a bonus stop on the trail, but much deserved! Top off your wellness discover with a relaxing massage at Shen Chinese Medicine. Dr Shen has over 20 years of experience and massage treatments start from $10. Whilst on your trail, don't forget to snap a selfie in front of the infamous and historic Queen Vic Market entrance, corner of Elizabeth St & Victoria St.